The Dome of the Rock (Masjid Qubbat As-Sakhrah, Hebrew: Kipat Hasela, Turkish: Kubbetüs Sahra) is an Islamic shrine and a major landmark located on the Haram al-Sharif in Jerusalem. It was completed in 691, making it the oldest extant Islamic building in the world. This building is considered a shrine and not a mosque. Inside the building in classical Arabic is inscribed, "O you People of the Book, overstep not bounds in your religion, and of God speak only the truth. The Messiah, Jesus, son of Mary, is only an apostle of God, and his Word which he conveyed unto Mary, and a Spirit proceeding from him. Believe therefore in God and his apostles, and say not Three. It will be better for you. God is only one God. Far be it from his glory that he should have a son." During the Crusades the Dome of the Rock was given to the Augustinians, who turned it into a church, and the Al-Aqsa Mosque became the royal palace of Baldwin I of Jerusalem in 1104. The Knights Templar, who believed the Dome of the Rock was the site of the Temple of Solomon, set up their headquarters in the Al-Aqsa Mosque adjacent to the Dome for much of the 12th century. Jerusalem was recaptured by Saladin on Friday, 2 October 1187 and the Haram was reconsecrated as a Muslim sanctuary. 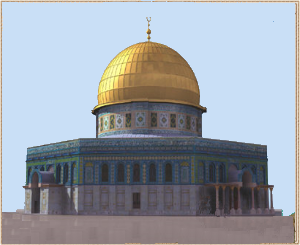 The cross on top of the Dome of the Rock was replaced by a golden crescent and a wooden screen was placed around the rock below.